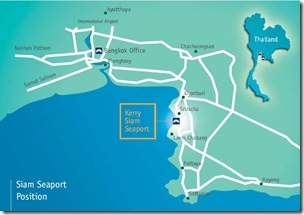 Kerry Siam Sea Port (KSSP), located closer to Laem Chabang – Eastern Seaboard Gateway of Thailand is expected to commence operations from January 2008. 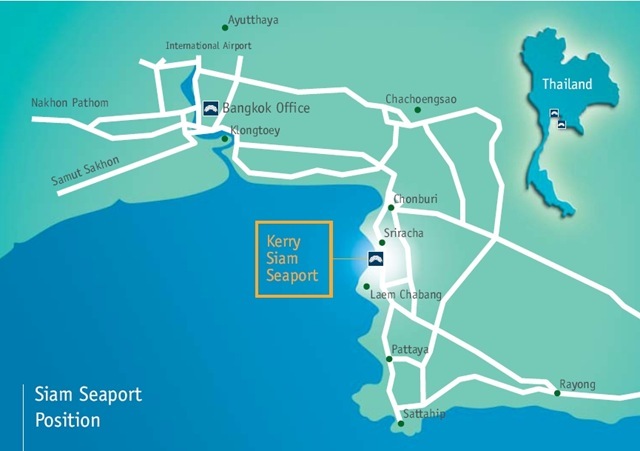 Closely knit rail, road and inland water transport links facilitate shipments to get moved to and from points of delivery within 2 days in Thailand and 5 sailing days to other major parts of Asia. With a 14.5 metres MSL depth of water, the 745 metres of berth line is capable of berthing 4 ocean going vessels. KSSP with vast warehouse space of 80,000 sq.m., high tech handling equipment and IT systems, can serve all shipping needs, with fast cargo handling and ship turn around time. Together with the existing 4 berths, the fully developed terminal will be capable of handling up to 7 vessels (maximum size 100,000 dwt). The container berth will handle deep sea and short sea business as well as inland shipping services from Bangkok Port. KSSP is the only Inland Container Depot in Laem Chabang port area to have equipped with on line customs clearance on site. Container cargo needs, such as container consolidation, value adding, lashing, wrapping, packing, sorting, etc. – can be safely served by KSSP logistics. KSSP is awarded International Ship and Port Security certification by the IMO certified body. KSSP is part of Kerry Logistics Network, one of the leading 3 PL service providers in the Asia Pacific Region operating in over 150 cities throughout 15 countries worldwide. By leveraging Kerry Logistics Network, KSSP will provide a fully integrated supply chain solution. OldSailor wishes all the best to KSSP.